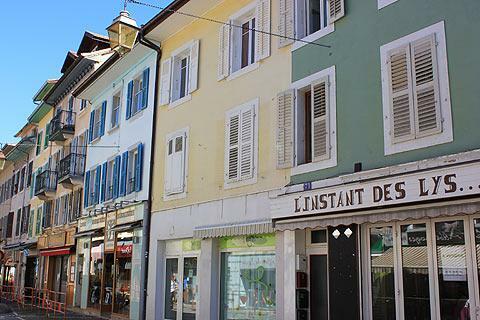 Thonon-les-Bains is an attractive town which on the edge of Lake Leman. 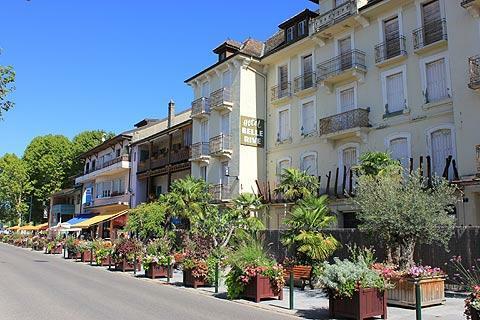 The town centre sits above the lake and its attractive port called Rives sits on the edge of Lac Leman, the biggest lake in Europe. 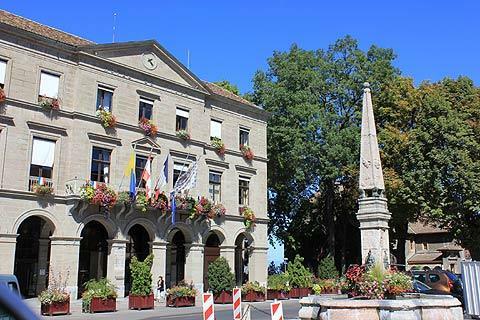 Thonon-les-Bains is the capital of the area known as Chablais. 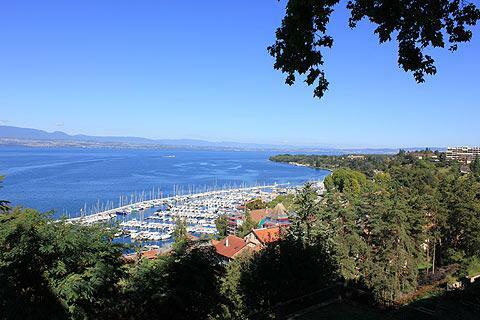 The centre of Thonon-les-Bains sits up above Lake Leman and offers some splendid views of the lake and the port of Rives below. 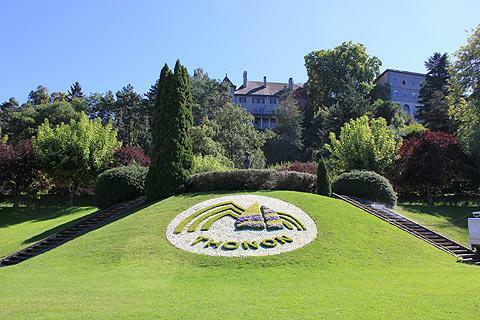 Its main attractions for the tourist lie in the lakeside activities however the centre of Thonon is pleasant and has an interesting mix of architecture. 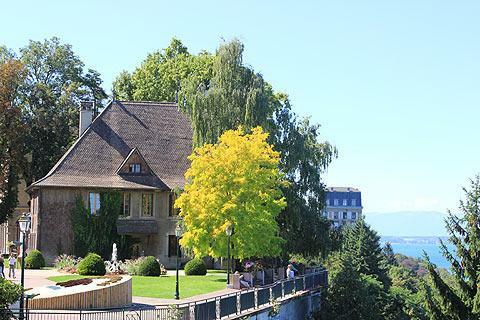 Thonon-les-Bains tourist office is housed in the Chateau de Sonnaz and as well as picking up some information about the town it is worth visiting the chateau for the splendid views you get over the lake, the port and the Chateau de Monjoux below. The Chateau de Sonnaz, built in the 12th century, also houses the Museum of Chablais. Close to the castle you can see the Hotel de Ville and the Porte des Lambards, the only remaining part of the ancient remparts of Thonon. Also here is the Chateau de Bellegard, and the ancient tribunal of Thonan which has various figures sculpted on its exterior. The church is interesting as it consists of two churches next to each other: the eglise Saint Hippolyte in a baroque style and the basilique Saint Francois in a neo-gothic style. Take a look inside the Saint Hippolyte church and you will be amazed by its beautiful colourful interieur. The walls and ceilings are beautifully painted with scenes from the Ascencion and the life of Saint Hippolyte amongst others. The Grande Rue passes by the church and continues past Thonon's oldest street, la rue Chante Coq which leads to the Chapelle de la Visitation which is now use for art exhibitions. 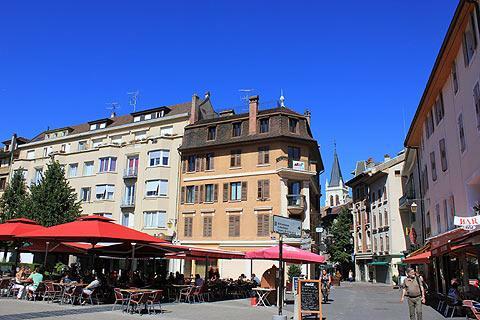 The heart of 'old' Thonon is the Place du Marché and, as well as a large pleasant square surrounded by a mix of Art nouveau and traditional Chablaisien architecture, you can also see the ancient monastery of the Visitation. 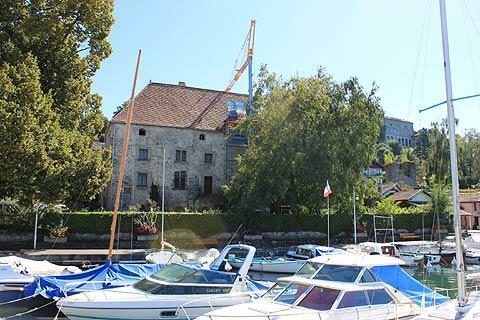 To get to the port of Rives on the lake-side you can take the funiculaire. This arrives at a beautiful funiculaire station built in the Belle Epoque style. 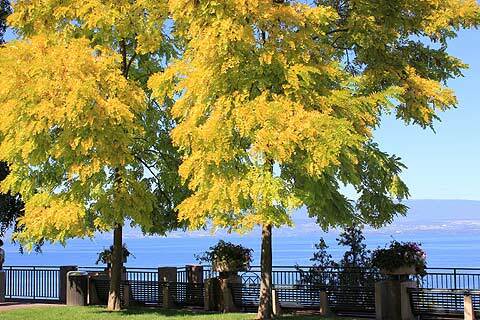 You can also walk down to the lake if you are feeling energetic. As well as the obvious attractions of walking along the lake shore or sitting in one of the cafés to drink a beer and watch the world go by there is a small fishing museum you can visit. This is in one of the old fishermen's houses and shows the evolution of fishing on the lake and has some aquariums with fish from the lake. Many visitors come to Thonon for its health spa where you can relax in the thermal baths, have a massage or even a fish pedicure! 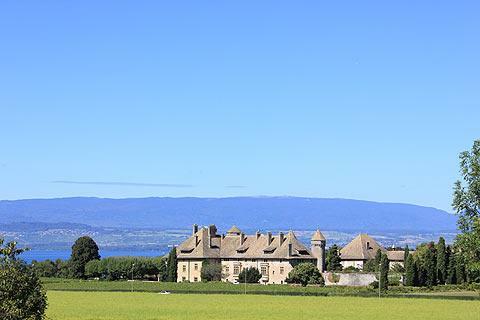 Within walking distane of Thonon you can see the Chateau de Ripaille where, as well as visiting the castle, you can do some wine tasting or admire the arboretum. 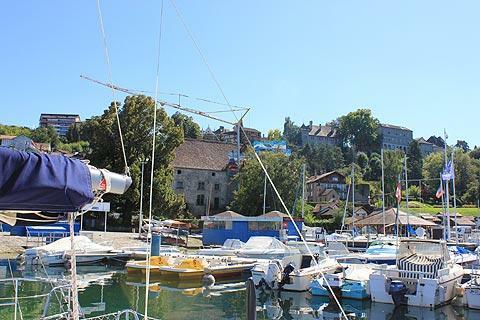 You will enjoy a walk along the Quai de Ripaille which is just next to the Quai de Rives, and visitors can also take a boat from Thonon-les-Bains to the beautiful Swiss towns of Montreux, Vevey and Lausanne. You can find more local travel ideas in the Haute-Savoie guide and the Rhone-Alpes guide.